When it comes to choosing bulb replacement technology in industrial environment even an extensive comparison of technical characteristics of LED and T8 hardly brings a clear winner. Choice depends on many considerations. We would like to resolve the competition comparing the total cost of ownership in Food & Beverage industry. Let me reiterate that commercially available T8s and LEDs produce similar amount of light, so quantity of fixtures per sqft may be considered the same. T8s are cheaper, but warranty allows only one turn on/off per 12 hours and the best output is guaranteed only at optimal temperature. LEDs produce stable light at any temperature and allow dimming, but they cost more. In F&B environment T8s have to be covered with plastic, while LEDs do not have breakable glass to start with. These are all valuable parameters, but if I am a plant manager, I want to have stable light at the lowest cost, right? LEDs come at $20 apiece; F&B-ready T8s – at $8. LEDs come with a 5-year warranty, which is about 44,000 hours. T8s come with 20,000-30,000 hour warranty, roughly half shorter. This means that for 5 years plant will need one LED or two T8s. Let’s assume that the replacement is done by an in-house electrician with a short ladder. He has to come to the place, install the ladder, possibly wait for the area to become available for his work, climb up, replace bulb, pick his staff and move on. In this fashion an electrician can replace 4 bulbs per hour or 24 bulbs per day, because he replaces bulbs only 6 hours a day. Electrician with overhead costs company at least $50 per hour. This boils down to a $16 bulb replacement cost. As a result, lighting with “cheaper” T8s costs $32 per 5 years in bulbs and replacement alone compared to $20 produced by expensive LEDs. Real-life bulb replacement cost in industrial F&B environment is times higher. If bulbs are located over production area a short ladder will not suffice, legally calling for two electricians on the job. Work will have to be done outside of regular work hours to avoid product contamination, calling for a 50% overtime premium. To work over 5ft each employee must receive an annual training costing $500 per head plus employee time; at least four people per plant will have to be trained adding $10,000 per 5-year period. Plus procurement, plus disposal, plus on-site storage of spare and burnt bulbs. Altogether, replacement of one $8 T8 bulb may easily cost company over $50. We have not even started to consider hi-bay lighting that calls for a rental of an elevated platform. How energy savings can add extra holidays at your plant? How to help CFO approve your energy project and keep healthy margins? 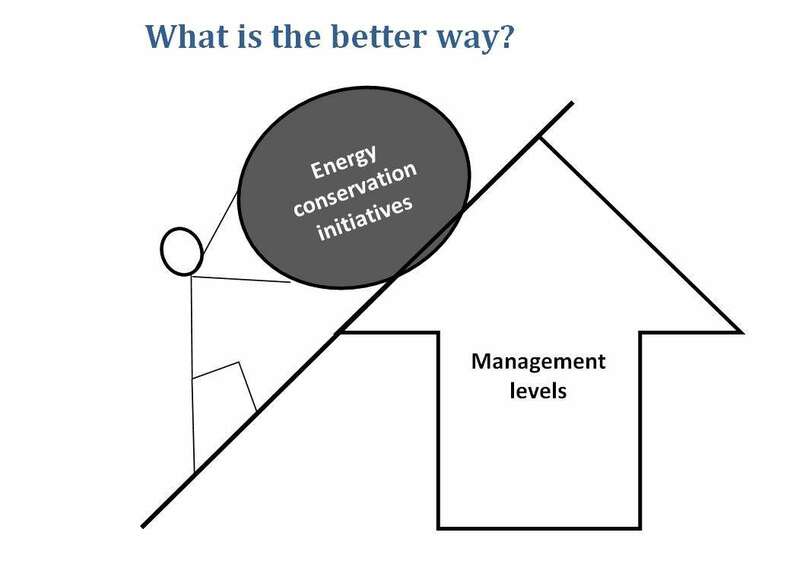 Energy conservation is an uphill battle, what is the better way?